For a dining chair that is both casual and comfortable, you simply cannot go wrong with the Freeman Light Brown Dining Chair from Moe's Home Collection. It features a superior iron frame for immense stability, along with top grain leather upholstery that delivers unparalleled style. 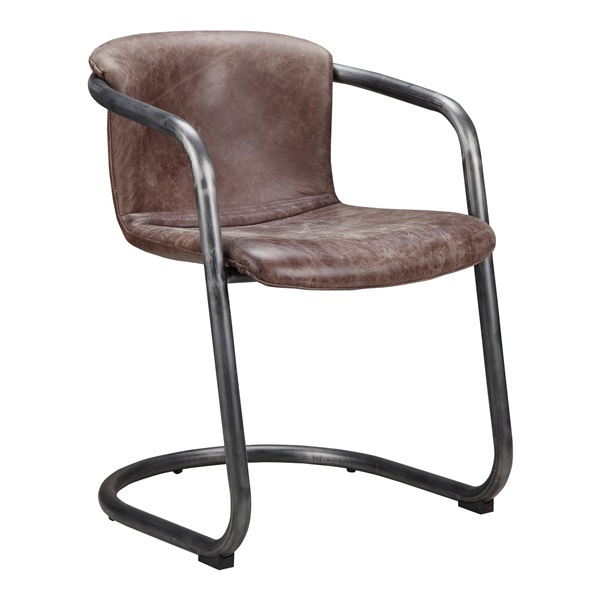 Plus, the dining chair's industrial-inspired appearance ensures the piece will make a distinct impression day after day. Choose a top-notch dining chair that blends fashion and function with the Freeman Light Brown Dining Chair. Top grain leather upholstery delivers amazing quality. Fireproof foam seating is both comfortable and practical. Iron frame offers long-lasting stability. Innovative design helps the dining chair complement the d�cor in a modern or traditional setting.